Antonucci Foods is located in Gloversville, N.Y. Established in 1982 we are a family owned and operated business with John Antonucci as president. Antonucci’s is a wholesale distributor of fresh produce, fresh and frozen seafood and a large variety of food service and specialty items. Antonucci’s is a SQF2 certified facility consisting of 60,000 square feet including a state of the art H.A.C.C.P certified seafood program. We welcome and encourage our customers to visit us and tour our facility. 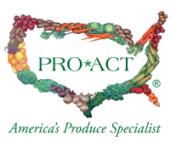 As a Pro*Act distributor we are committed to food safety, quality and sustainability. Antonucci’s is a member of the “Trace Registry” which enables us to trace all products to its origin. We support the “Pride of New York Program” and all of our produce is grown by GAP (Good Agricultural Practices) certified farms. Antonucci’s is also proud to be part of the “Greener Fields Together Program” which is a national program dedicated to ongoing sustainability improvements and food safety practices. We offer significant cost-benefits and an easy, one call solution to secure the freshest produce. Antonucci's provides category cost management through commodity contract pricing and in- house consultation services bringing optimal economic value and food safety to our customers. Our corporation services twenty-one counties in a 200 mile radius and our customers include foodservice and retail accounts. Antonucci’s provides the freshest quality produce, seafood and professional service to over 1400 accounts. Our Market Reports and social media updates keep our customers abreast of the latest information and enables them to manage their business more effectively. All of us at Antonucci Foods take pride in our exceptional, individualized customer service and we guarantee the freshness and consistency of all our products. We service all of our accounts as if they were in our back yard and that is the reason the finest chefs depend on our partnership to deliver excellence to their patrons. We are here for our customers fifty-two weeks a year from 4a.m. - 2p.m. Monday – Friday and 4 a.m. to 8 a.m. on Saturday. For after hours service we offer online ordering and voice mail where orders can be placed for the following or future day delivery. Great service is just moments away!